I often find myself looking for inspiration for blog posts. Recently I have been having an issue with a large dog (not mine) roaming freely in my yard. I first learned this because it has been leaving very large “presents” for me… I find them near my entrance door, in my driveway, on the path to my back deck… You name the place and I can tell you that I have had the misfortune of finding a big pile of gross, squishy, smelly present there. Needless to say, when I noticed a little blurb saying “This light is a camera” on the cover of the August 2016 issue of This Old House, I was inspired to look closer. I am not a techie by nature and don’t have to have the latest and greatest technology as things come out, and despite frequently having my garden stand stolen from, I wanted to believe in people and not invade their privacy by installing outdoor surveillance. After a winter of watching daily newscasts reporting on packages being stolen from doorsteps and almost daily unwanted “gifts” being left for me, I have started to rethink things. When I first saw the article talking about this light, I was really hoping that it could solve my problem by simply getting a look at the dog. However, I (and my shih-tzu Isabella) have now had several encounters with the dog. I have learned that it is very timid, friendly, and REALLY likes Isabella. She does not return the sentiment! What I have not learned is who owns this dog or where she belongs. She has a collar with a rabies tag but no name tag and even though it quite aggressively wants to get into my house, it is NOT going to become an inhabitant! It’s a camera… It’s a light! …Back to this fantastic light! So, the camera may not be my solution to finding the owner of the mystery dog, but have I mentioned that this light not only features a high def video camera but also has a microphone, a speaker that can sound a 100-decibel siren and a motion detector that can turn on the light and/or start video recording!? Now I mentioned that the dog is timid. When I firmly told the dog to go home so that I could bring Isabella back out to do her morning business, it cowered, tucked it’s tail and seemed scared (but didn’t budge). It broke my heart! So I assure you that I will NOT start with the 100-decibel siren to scare it away. I won’t start with it, but now that we are in free-range chickens days, I will absolutely get there if I happen to see it going near my girls! Hopefully I can freak it out enough to go home just by talking to it over the microphone! 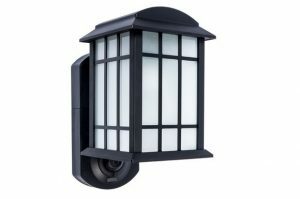 I know that there are many options out there to choose from and I haven’t selected the one that I want yet, but I have to say that the one listed in the article (Kuna Smart Home Security Light) has very nice options and very good reviews. They are advertised as easy to install and can be controlled from a smart phone or tablet and is connected through Wi-Fi. You can watch a video feed in real time. I am really looking forward to picking out and installing one! If you have one and have thoughts or an opinion to share, please leave a comment. Once I have installed mine, I will take a photo and post my thoughts on our Facebook page. So far the only draw back that I can find from reading reviews is that the general consensus is that the optional subscription fee (starting at $4.99 per month) is really a necessity if you want to download more than 3 clips in a month or be able to view them for more than 2 hours. For peace of mind (and possible protection for my chickens!) it’s a small price to pay. Now if I could only find the owner of the rambling dog… At least there will be a nice bright light to help me watch for presents!